Arctic Climate Impact Assessment - Scientific Report(3.5 Kg): 9780521865098 Hardcover - LIMEROCK BOOKS INC. The Arctic is now experiencing some of the most rapid and severe climate change on earth. Over the next 100 years, climate change is expected to accelerate, contributing to major physical, ecological, social, and economic changes, many of which have already begun. Changes in arctic climate will also affect the rest of the world through increased global warming and rising sea levels. 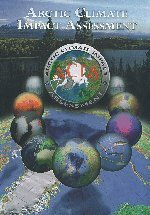 Arctic Climate Impact Assessment was prepared by an international team of over 300 scientists, experts, and knowledgeable members of indigenous communities. The report has been thoroughly researched, is fully referenced, and provides the first comprehensive evaluation of arctic climate change, changes in ultraviolet radiation and their impacts for the region and for the world. It is illustrated in full color throughout. The results provided the scientific foundations for the ACIA synthesis report - Impacts of a Warming Arctic - published by Cambridge University Press in 2004.